You are curenlty in 3m Health Care Particulate Respirator And Surgical Mask , White, Flat-Fold made by 3m Healthcare and asigned to category. Flat-Fold, 3-Panel Design That Gives It A Comfortable Fit. Unique Design Fits Most Face Sizes And Head Shapes Allowing Standardization To A Single Respirator. Highly Fluid And Splash Resistant. Singly Dispensed In Individually Packaged, Sealed Pouches To Prevent Contamination. You have selected 3m Health Care Particulate Respirator And Surgical Mask , White, Flat-Fold from Miscellaneous Disposables. We hope that this 3m Health Care Particulate Respirator And Surgical Mask , White, Flat-Fold made by 3m Healthcare is what you were looking for. If you have any questions about this particular 3m Health Care Particulate Respirator And Surgical Mask , White, Flat-Fold or any other products from Miscellaneous Disposables, please call us. We have an experienced staff that will gladly help pick out the correct 3m Health Care Particulate Respirator And Surgical Mask , White, Flat-Fold for you, also. 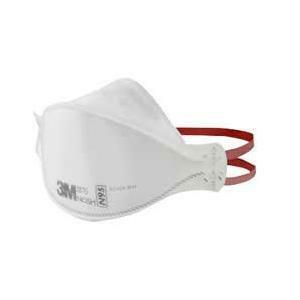 If you are looking to make a purchase of 3m Health Care Particulate Respirator And Surgical Mask , White, Flat-Fold in large quantity or you are a Hospital or Medical facility and need help on making a purchase of 3m Health Care Particulate Respirator And Surgical Mask , White, Flat-Fold made by 3m Healthcare, please contact us.